When Korean cosmetics retailer Innisfree launched its second New York City store right next door to a major competitor in late 2018, the brand knew it needed a store design that would grab the attention of people passing by and convince new customers to step inside. Working with Creative Realities, an end-to-end digital integrator based in Louisville, KY, Innisfree decided to capitalize on the store’s curved floor-to-ceiling street-front windows and install a huge, super-bright NanoLumens ENGAGE Series LED display that measures 16.73 feet tall by 8.66 feet wide and is easily seen from the street, 24 hours a day. The digital signage professionals at Creative Realities took all the variables and store needs into account, and determined that an existing interior wall would be an ideal location to mount a large LED display. After comparing the capabilities, quality, and pricing of products from leading LED manufacturers, they decided that a NanoLumens ENGAGE Series display would provide the best picture quality, the most reliable and worry-free operation, and enable the store owners to present beautiful, colorful imagery without creating a tech-heavy appearance. According to Warren, a major part of any digital marketing effort is sending the right message at the right time, in the right part of the customer journey. By conceiving a digital strategy in this way, Creative Realities can use NanoLumens displays to solve specific pain points such as improving foot traffic, extending browsing times, or increasing the value of purchases. The content shown on the NanoLumens LED display keeps with the store’s design influences, presenting images of flowing landscapes and nature scenes. Warren also noted that millennials and younger customers are often looking for a do-it-yourself shopping experience, where they can shop with the aid of modern technologies instead of relying on store employees for guidance. 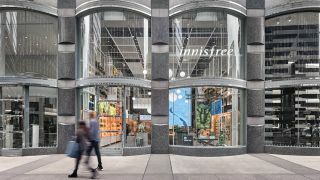 Besides the technology, the store design features another unique element, particularly for Manhattan: several wall sections and a large center display are covered with a variety of vibrant green plants that represent the natural ingredients used in Innisfree’s products.